"An unusually nuanced James Franco carries this complex portrait of a man who came out and fought to encourage other LGBT youth before converting to conservative Christianity." ​"Justin Kelly's first feature offers an evenhanded portrait of its controversial subject, but it doesn't make his decisions easy to take." 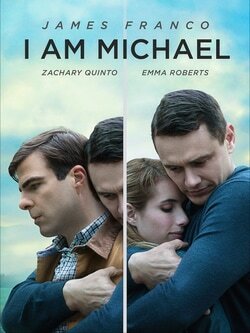 "Franco's latest film, I Am Michael, is easily the most thought-provoking work he has done in this area"
Michael Glatze (Franco) is handsome, charismatic, and opinionated. An Ivy League grad with multiple degrees, he’s a writer, pianist, and “queer theorist,” espousing his belief that sexual orientation shouldn’t define one’s identity. After years co-editing the iconic XY Magazine, a gay periodical based in San Francisco, he moves to Halifax, Nova Scotia, Canada, with his charming and intelligent architect-boyfriend, Bennett (Quinto). Michael experiences a traumatic health scare during which he thinks he’s going to die. Plagued by doubt, paranoia, and fear about the afterlife, he begins to question his beliefs and his identity. Once deemed healthy, he’s convinced that God saved him, pushing him to explore religion, eventually coming to his own decision that homosexuality is not a God-given identity. Michael renounces his gay lifestyle, rejects his friends, and endeavours to find his “true self.” He explores Buddhism and Mormonism, yet ultimately lands at a Christian Bible school in rural Wyoming where he meets his girlfriend, Rebekah (Roberts), and becomes the pastor of his own church. This powerful film captures one man’s fascinating, complex, and haunting journey through modern concepts of love, denial and redemption. More than just a story about “a gay man who goes straight,” the film explores the power of belief and the desire to belong.